Fig. 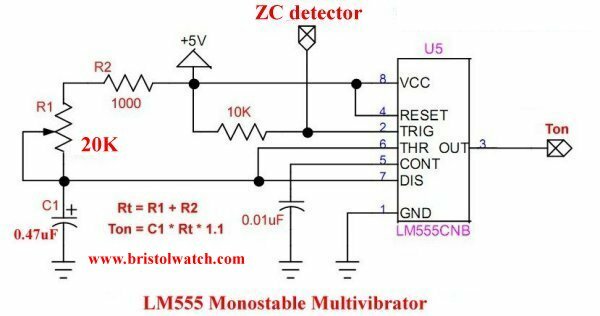 1 LM555 monostable multivibrator circuit. The goal of this webpage is to teach electronics to my students across the web. This is not about a finished product. If using voltages higher than 24 volts AC do so at your own risk. Here I will look into using a 555 timer as a one-shot multivibrator. A one-shot multivibrator produces an output whose on-time is based on a resistor-capacitor charge-discharge circuit. It exists in only two states - ON/OFF. Let us define terms. The 555 has been manufactured by a number of companies. This is often known as the NE555 or LM555. A: Discuss the operation of a LM555 circuit and timing. B: Then I will use the LM555 with a zero-crossing circuit to demonstrate AC power control. Fig. 1 illustrates a LM555 connected in its monostable mode. Pin 3 is the output while pin 2 is the trigger pulse input. Pin 2 is pulled HIGH by a 10,000 Ohm resistor connected to Vcc of 5-volts. Pin 3 output is normally a LOW or 0-volts output. Example 1: R1 is adjusted to a total resistance of 50,000 Ohms while C1 is 100uF. What is the ON time (LED on) t? t = R * C1 * 1.1 = 50,000 * .0001 Farads * 1.1 = 5.5 sec. Example 2: What the maximum and minimum ON time for a 1000uF capacitor? t max = 1000uF * 101,000 Ohms * 1.1 = 111.1 sec. t min = 1000uF * 1000 Ohms * 1.1 = 1.1 sec. Important note: while SW1 is pressed the output will remain HIGH even after time t has elapsed until released. Fig. 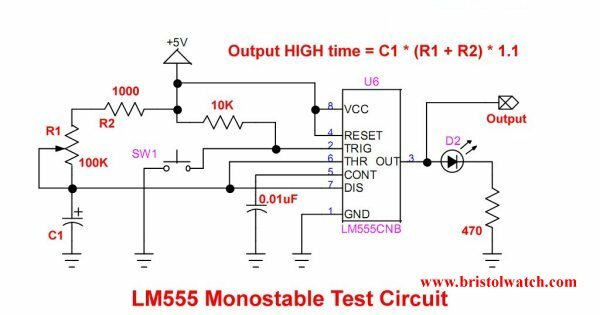 2 LM555 monostable circuit for 60Hz power control. t max = 0.47uF * 21,000 * 1.1 = 10.9 milliseconds. t min = 0.47uF * 1000 * 1.1 = 50 microseconds. 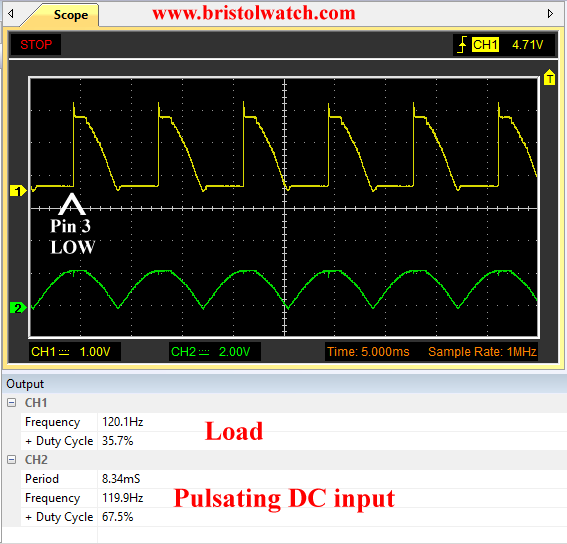 The negative going zero-crossing pulse is input on pin 2. Fig. 3 MOC30XX based AC power control. A 60 Hertz period is 1 / 60 = 16.7 milliseconds. We have to control a triac circuit at the half-cycle which equals 8.33 milliseconds. Fig. 3 illustrates a MOC3010 type opto-coupler connected to a triac, and a 24-volt lamp connected to a 24-colt AC supply. When the LM555 pin 3 is LOW, its normal state, the triac circuit is turned on - the lamp is on. The Q1 triac is a generic sensitive gate triac. See my page Basic Triacs and SCRs. Note I'll be using the pulsating DC at TP1 instead of AC but this works the same. Fig. 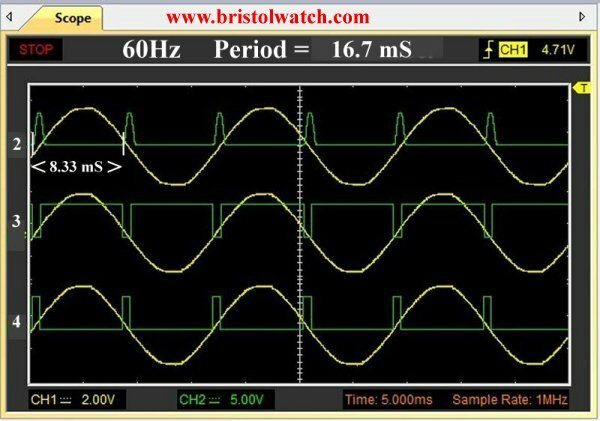 4 illustrates LM555 monostable trigger pulse versus output waveforms. When pin 2 goes LOW or zero volts output pin 3 goes HIGH or Ton. 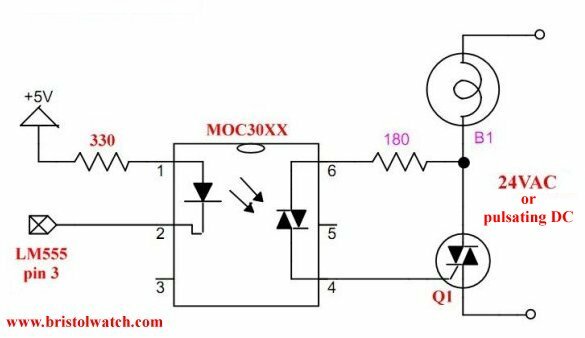 During Ton the triac circuit is turned off. 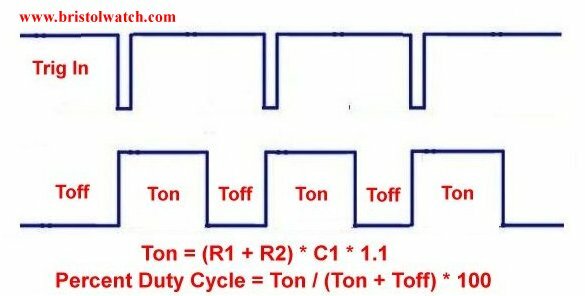 The triac circuit is turned on only during Toff. The longer the delay for Ton to 8.33 milliseconds less energy is supplied to the load. By adjusting R1 thus Ton we control the lamp intensity. Do not adjust R1 for a time period t greater than 8.3 milliseconds or control will be lost. Fig. 5 Zero-crossing detector circuit. Fig. 5 show one example of a zero-crossing circuits. Use connection A for this circuit. Fig. 6 60 Hertz alternating voltage versus zero-crossing detector pulse. Fig. 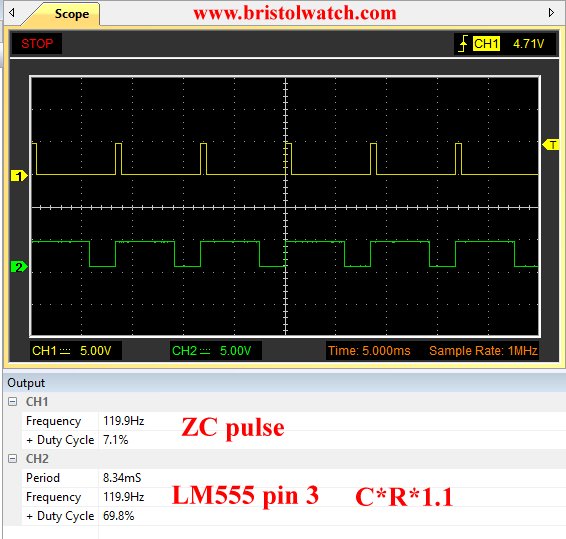 7 Zero-crossing pulse (B) versus LM555 monostable output pin 3. Fig. 8 Triac output versus pulsating direct current input. Fig. 8 illustrates the load voltage versus the pulsating input voltage at TP1 in Fig. 5. Fig. 9 Zero-crossing pulse versus load voltage.